The future of naval warfare is increasingly shifting to undersea competition, in both manned and unmanned systems. American seapower has excelled in this domain and holds a competitive edge today beneath the waves. But the U.S. Navy, by a combination of compressed funding and potentially crippling procurement cost increases, may not be well positioned to sustain its mastery of undersea warfare. Near-peer competitors, such as Russia and China, are both committed to improving their undersea capabilities. The People’s Liberation Army Navy (PLAN) now possesses one of the largest fleets in the world, with more than 300 ships, including five SSNs, four SSBNs, and 53 diesel-powered attack submarines (SS/SSPs). Russia has engaged in increasingly hostile naval activity, including targeted provocations and intimidation of NATO partners and allies, and continues procurement of the fast, heavily armed, and deep diving Severodvinsk-class SSN/SSGN. Additionally, China’s and Russia’s development of Anti-access/Area-denial (A2/AD) capabilities pose a major threat to the United States’ ability to secure sea control in their respective regions and, in the case of China, threaten critical United States naval facilities in the Western Pacific. In 2014, the Navy updated its 2012 Force Structure Assessment (FSA), concluding that a total battle force structure of 308 ships, including 48 SSNs, 0 SSGNs and 12 SSBNs, would be required to meet the anticipated needs of the Navy in the 2020s. While the projected 2017 submarine force—51 SSNs, 4 SSGNs and 14 SSBNs—currently exceeds the requirements as laid out in the March 2015 308-ship plan, the Navy anticipates a shortfall as Los Angeles-class SSNs are retired at a faster rate than Virginia-class SSNs are procured. The Navy’s FY2017 30-year SSN procurement plan calls for the procurement of 44 Virginia-class SSNs by FY2046, with production varying from one to two SSNs per fiscal year, at a cost of $2.4 billion each. If implemented, the SSN force would drop below the 48-ship requirement beginning in FY2025, reach a minimum of 41 ships in FY2036 and would not meet the 48-ship requirement until FY2041. Beginning FY2027, the Navy’s 14 Ohio-class SSBNs are scheduled for retirement at a pace of one ship per year until the class is retired in FY2040. Table 2 shows the Navy’s schedule for the retirement of the Ohio-class SSBNs and the procurement of 12 Columbia-class SSBNs set to begin replacing the Ohio-class in FY2030. Under this proposed procurement plan, the Navy’s “boomer” force will drop below the stipulated 12-ship requirement by one or two ships between FY2029 – FY2041. The Navy has recently updated its assessment of the fleet and has proposed a larger 355-ship force. The resource implications of building and manning almost 70 more ships beyond today’s fleet is daunting. The underlying strategic rationale for this force and its resource implications have not well-articulated by the new Pentagon leadership or the administration. 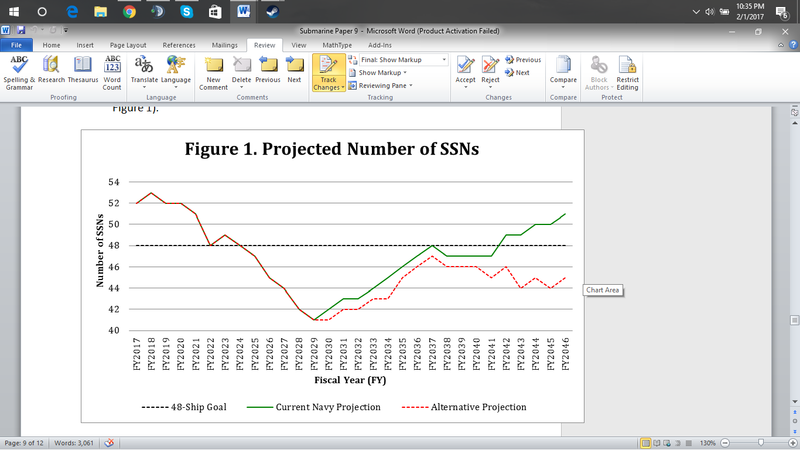 Of particular note, the force structure assessment calls for 66 SSNs. The Navy’s new plan is supported by other analysts who have advocated for alternative force structures. According to the Heritage Foundation, the Navy should be composed of 346 ships, with 55 SSNs. Another alternative structure, developed by Bryan Clark at the Center for Strategic and Budgetary Assessments, proposes a fleet architecture “to provide the United States an advantage in great power competition with China and Russia or against capable and strategically located regional powers such as Iran.” This proposed architecture calls for a fleet composed of 343 ships, with 66 SSNs. In another proposed alternative, analysts at the Center for a New American Security conclude that a 350-ship navy is “the bare minimum that is actually requires to maintain presence in the 18 maritime regions where the United States has critical national interest” and calls for the enlargement of the Navy’s SSN force to “more than 70” ships. It is clear from these studies that conventional wisdom from the naval cognoscenti shows a strong consensus for not only sustaining our submarine force but actually increasing it. It is equally clear that the U.S. Navy’s shipbuilding plan is unlikely to achieve the desired fleet totals and that the plan, in its current state—that is largely based on optimistic cost assessment factors—is unfeasible. The administration may resolve that with an infusion of funding but sustainable support may not be forthcoming from either OMB or the Congress. Moreover, there are plausible factors that could exacerbate the shipbuilding crisis for the Navy that could cripple even today’s nearly anemic plan. This paper explores that scenario. However, given the current budget constraints under the Budget Control Act of 2011, as amended, and the Navy’s current share of the overall Department of Defense budget—nearly 28 percent in FY2017— it is unlikely that the Navy will receive the robust funding it needs from both its Shipbuilding and Conversion, Navy (SCN) account and the National Sea-Based Deterrent Fund (NSBDF). Any negative impact on the construction of other ships will commensurately impact the shipbuilding industrial base, reducing economies of scale, causing shipbuilding cost to “spiral unfavorably.” Thus, the Navy clearly recognizes that its current shipbuilding plan is highly risky and cannot be reasonably executed without additional funding. Even with additional funding, it is entirely possible that the funds would be used to properly fund the shipbuilding account or meet unplanned cost growth. Historically, the Navy has systematically underestimated the cost of procuring new ships and the accuracy of the Navy’s estimated procurement cost for the Columbia-class ship is soft at best. In an October 2015 report by the Congressional Budget Office (CBO), it was estimated that the Navy’s FY2016 30-year Shipbuilding Plan underestimated the cost of Virginia-class SSNs by around three percent and the cost of the Columbia-class ships by as much as 22 percent. Historical underestimation of shipbuilding cost led CBO to estimate that the lead Columbia-class SSBN would cost 13.2 billion in FY2015 dollars, with boats 2 through 12 costing $6.8 billion in FY2015 dollars, an average of $7.1 billion per ship. This cost growth would consume more of the Navy’s constrained shipbuilding and procurement accounts, and either stretch out the program (increasing total costs) or more likely, divert funds from Virginia-class production. 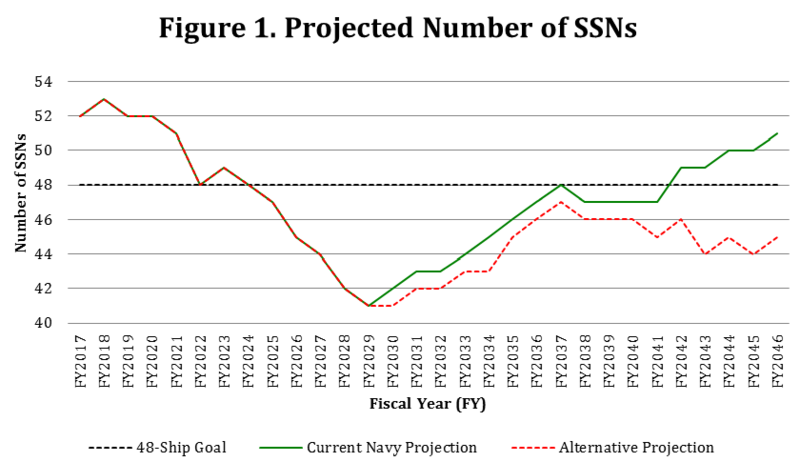 Given how the Navy has increased its requirement for ships and submarines while underestimating the cost of programs, it is very possible that the Navy will be able to afford to procure only one SSN per year after FY2023. The implications of this scenario are profound for undersea dominance. Without substantial increases in the Navy’s shipbuilding accounts or successful acquisition management of the predicted costs of the Columbia-class SSBN program, it is likely that the SSN shortfall will be more severe and lengthier than depicted. If procurement of Virginia-class SSNs is reduced from two to one per FY in FY2025, FY2036-FY2039 and FY2041, the shortfall of SSNs will continue beyond FY2046. Furthermore, by FY2046 the Navy will have six less SSNs than predicted in its 30-year Shipbuilding Plan and be three SSNs short of its 48-ship goal (See Figure 1). The first implication of this scenario is the need for senior Navy leaders to gain approval and the requisite funding for their Force Structure Assessment from the new Administration and Congress. The second implication is the need to prioritize available SCN funding for Virginia-class attack boats to ensure that the potential “crash dive” scenario does not come about. As the seabed grows in economic and military importance, UUVs can act “as force multipliers and risk reduction agents for the Navy” and work autonomously or in conjunction with manned systems conducting a wide range of missions. UUVs can be used to monitor United States and allied seabed systems and survey, and if necessary attack, adversary’s seabed systems. Furthermore, UUVs can provide access to areas that are too hazardous or too time consuming to reach with manned platforms. With this enhanced access, UUVs could act as long-term ISR platforms and provide real-time, over-the-horizon targeting information for manned vessels. Likewise, large-scale UUVs could also be used to conduct intelligence gathering missions because of their ability to carry a lot of advanced sensors at a fraction of the cost of the Virginia-class SSN. The Navy is pursuing extra-large unmanned undersea vehicles with this in mind. Allowing UUVs to conduct such missions not only unburdens the SSN fleet, but also minimizes the risks to the multi-billion dollar Virginia-class SSNs and their crews. Furthermore, UUVs have the capacity to conduct routine yet important and repetitive missions that may not require the attention of multi-million dollar manned vessels. For example, UUVs could be used to maintain and observe valuable undersea infrastructure—such as the U.S. undersea cables that carry the bulk of the world’s Internet data. Another important capability of UUVs is their potential to provide the Navy with an option for non-lethal sea control. As pointed out in the most recent Navy Unmanned Undersea Vehicle (UUV) Master Plan, “current undersea capabilities limit options for undersea engagement of undersea and surface targets to either observation/reporting or complete destruction.” Non-lethal options provided by UUVs could be used in situations short of war and support de-escalation during times of heightened tension.